I’ve finally acquired an apprentice. My new roommate and friend wanted to learn how to cook, so off we go! What about the eater you say? Sure, the eater helps out now and then, but I can tell she isn’t all that thrilled about cooking most of the time. I can now push off all those terrible cooking jobs I don’t want to perform on my new found assistant under the guise of training. 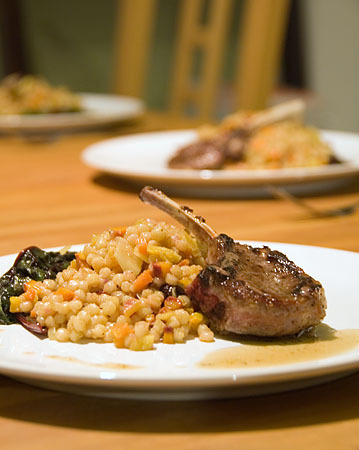 I really had no plans or recipes and just intended to teach as I cooked; then apprentice came home from the supermarket with a small package of lamb chops. Lamb is usually something I don’t buy or even consider making. The apprentice was interested in learning how to cook them so I made an exception and wasn’t disappointed. 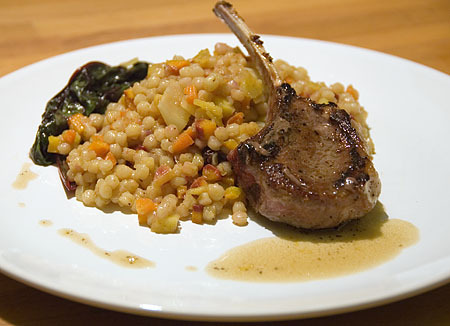 The lamb was paired with a Moroccan couscous and some wilted chard that I grew in my tiny garden. The apprentice slaved away with the prep work as I continued to refine the recipe in my head as we went along. Nothing was formally written and I just barked out directions as we went. None of the components of the dish were terribly difficult but each of them had a few things to learn. The couscous had finely diced carrots and shallots and was topped off with raisins. The greens were washed and quickly wilted in olive oil and garlic. The lamb chops were Frenched, seasoned lightly, and pan seared. At the very end, the pan was deglazed with red wine and a touch of butter was added for a quick pan sauce. I think it was a good first lesson. A solid B+. I don’t think I pushed him too hard, maybe he’ll continue his studies. push too hard and the apprentice will wilt. I’m sure I’ll post a picture one of these days.